While baseballs are fairly small and easier to protect, larger items, like basketballs, soccer balls and volleyballs, can present more of a problem for collectors. Dust, humidity and general wear is all out to get your treasured item and Ultra Pro Displays present a useful option to protect these big sports items. 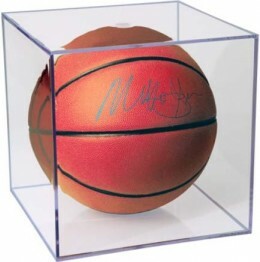 A larger signing area and the overall display potential makes it easy to see why many collectors acquire signed basketballs and soccer balls. While the size can make storage more of a problem, Ultra Pro offers several ways to protect and display these items. Click on the listings or image to shop for displays online. Simple and effective, the Ultra Pro Basketball Display is ideal when you want to protect a basketball, soccer ball or volley ball from potential damage. The two-piece design is easy to assemble with a slide-in bevel and allows for full view of the ball from any angle. Interior Dimensions: 9-3/8" x 9-3/8" x 9-3/8"
Basically the same as the Ultra Pro Basketball Display, the Ultra Pro UV Basketball Display adds ultraviolet protection, which can be very useful in a bright location. UV protection - read further information about the benefits of UV protection here. One of the more premium options for protecting basketballs that does not involve a glass exterior, the Ultra Pro Z-Design Basketball Display is a larger version of the UV case above. However, the main difference is the unique Z-Design stand, which gives the impression of a hovering ball. The case is also slightly larger. The plastic case also consists of two pieces, but the main clear portion is all one piece, making it very easy to quickly protect your items. Collectors can remove the included stand to take advantage of the larger space for something like a tall figure or doll. It is important to note that the box the Ultra Pro Z-Design Basketball Display comes in is quite large. Interior Dimensions (w/o stand): 10-3/8" x 10-3/8" x 10-3/8"